Editor’s note: This post was originally published on February 9, 2008, and was substantially revised and republished on August 13, 2012. A few years ago, every little girl seemed to be answering to Maddie, whether it was Madison or Madeleine or something else on her birth certificate. Today, we’ve dropped the M, and the most dominant sound on the playground is Addie. There’s no shortage of attractive appellations that can lead to this friendly nickname. Whether you’re after a popular pick or an obscure one, there’s something to suit any parent who likes the idea of having a daughter answer to Addie. Addison – In 2006, Addison ranked #27. By 2011, she was up to #13. That’s not counting spelling variations: Addyson, Addisyn, and Adyson all rank in the US Top 1000. She was already on the rise when the popular Grey’s Anatomy character appeared on the small screen, and the rest is history. Adair – A surname name derived from Edgar, Adair feels wearable for a girl, thanks to references like the ill-fated Virginia Dare and Dead Like Me’s Daisy Adair. She’s a surprising alternative to Addison and company. Actress Adair Tishler played a recurring character on the NBC sci fi hit Heroes. Adelaide – Back in 2005, Adelaide returned to the US Top 1000 after more than five decades’ absence. Today she’s climbed to #407. Not only does she lead to the stylish Addie, Adelaide is also a place name. The South Australian metropolis was named after the nineteenth century Queen Adelaide, wife of William IV of England. 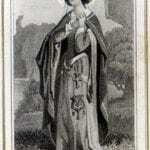 With other regal and saintly bearers of the name, she’s rich with history and prime for revival. Adeline – Sweet Adeline ranks just #288, but she boasts the most variants of any name on this list. There’s also Adalyn, the most popular spelling at #214, followed by Adelyn (#300), Adalynn (#327), Adelynn (#582), and Addilyn (#788). Ada – A logical successor to Mia and Ava, Ada is a sweet, short, complete name that could lead to Addie as an affectionate nickname. Adelina – If you’re torn between Olivia and Adeline, this elaboration is a great compromise. Adele, Adela, Adelia – The Grammy-award winning singer has boosted her given name back into the US Top 1000. The ends-in-a version has yet to return to use, but remains a possibility. Adelia is also seldom heard, but would serve as a hybrid f Adele and Amelia. Adelais – Sometimes listed as a French variant of Adelaide, the softer “s” ending might appeal, and, of course, is far less common. Adelie – A French form of Adele, and the name of a type of penguin. The Antarctic bird got its name from Adèlie d’Urville, the wife of French explorer Jules Dumont d’Urville. Sure to be confused with Natalie and Hadley, but a stylish possibility anyhow. Aderet – I found this one on a search, said to be from a Hebrew word meaning cape. It is probably the rarest of the names on this list, but her sound appeals. Adalia – Another Hebrew name, this one borrowed from Bible – and from the boys. Adalia is another form of Adlai, but seems better for a daughter in 2012. You might also arrive at Adalia as an elaborated form of Ada or Adela. Adina – She has a similar story to Adalia – another masculine Old Testament name used for girls in recent generations. It is easy to imagine inventing Adina – or Adinah or Adena. Adesina – If you’re searching for a moniker with African flair, this Yoruban rarity might be the one. Aderyn – A modern Welsh nature naming meaning bird, Aderyn fits in with Addie and all of those other avian appellations so in vogue. Adilet – I’m fascinated by this rarity, listed as a gender neutral Kyrgyz name meaning justice. It’s also the name of a political party in Kazakhstan, but that’s probably obscure enough that Adilet could wear well in the US today. Caridad – The Spanish answer to Charity, it’s a virtue name that would typically shorten to Carrie in American English and Dadi in Spanish – but could work with Addie, too. Ariadne – She saved Theseus from the Minotaur in the maze, but has never been popular with American parents. In our Chloe/Zoe/Penelope age, there’s no reason to think Ariadne couldn’t fit right in. Adriana, Adrianna, Adrienne – All three are feminine forms of Adrian, each with their faithful adherents. Sound-wise, getting to Addie is something of a stretch, but the letters are right there. 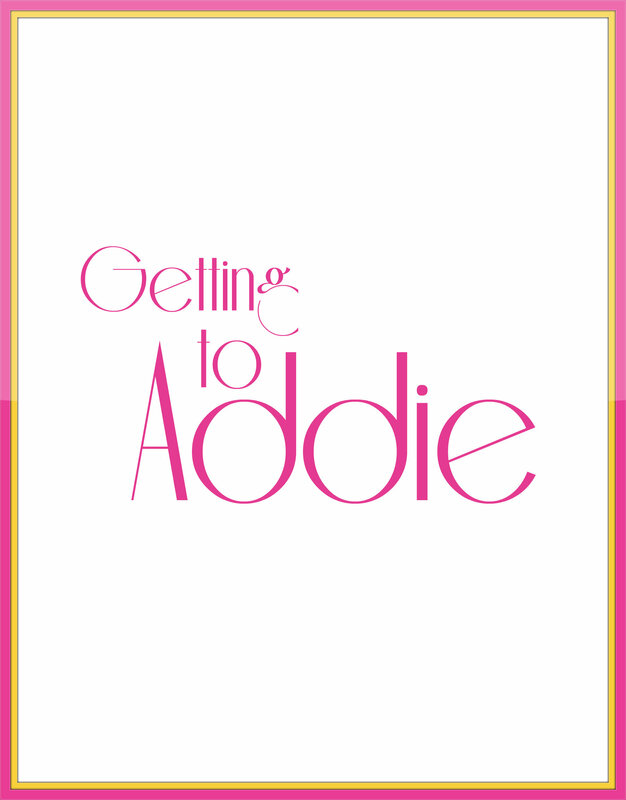 Would you ever use Addie for a daughter’s name? If so, which formal version would you use? Are there any I’ve overlooked? My 15-year-old daughter’s name is Adorae. (The accent is on the first syllable.) She mostly goes by Addi these days, though she waa called by a few other nicknames in her younger years. I really like this nickname, especially with the full name Adelaide. Here in Britain, I think that nickname would be quite unique, since we don’t get many Addison, or none that I have met anyway. However, I think the name Addie will always remind me of Hitler, since watching a documentary/film at school where Hitler’s mother nicknamed him Addie. I think I’d feel weird calling it my child, but without that association, I think I’d maybe use it. I know a kid named Adriana who has always been called Addie. She’s around 8 so her mom was a little ahead of the curve. If you pronounce Adriana in Spanish it makes more sense. I love Adelaide and Adair. I too hear “Addison” and immediately cringe and think “disease.” Then I think “JFK.” I do love some of these alternatives though! My Peter was almost named Peter Adair, so it’s a guilty pleasure of mine, but I prefer it for boys. Some close friends of mine have a gorgeous little 2 year old girl called Addison. She is almost always called Addie. I thought it was a strange name to begin with, but now I cant imagine her being anything other than little Addie. I also went to school with an Adina, and think that’s a lovely name. My personal favourite is Adelaide. It’s on the top of my baby girl list at the moment, although because I already know an Addie, her nickname would be Ally or Ellie. Addie was the name of the scary old lady on our block when I was a kid, so the name does *nothing* for me. But I do have a 7 year old cousin (what, exactly do you call your first cousin’s kids? ), named Addison and all I think is disease too when I see her name in full. It’s not a family surname that I’m aware of (on her side or his) but as long as my cousin Pam is ok with me calling her oldest Addie, I’ll live. The younger is another A name that escapes me ATM. 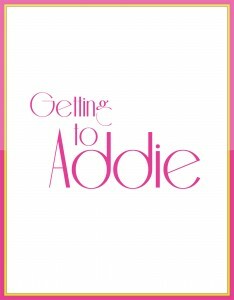 I’m not a fan of Addie, but I do love some of the “Getting To” options. Adelaide, Aderet, Ariadne, and Adrienne are all gorgeous. With regards to Adelaide, the nickname Lady tempts me far more than Addie, and I prefer Adelheid “Heidi” even more so. I also like Angharad, Adaeze, and Adara. Adair is my guilty pleasure! Not the type of name I would normally like, but I like that it’s feminine without being too frilly. Love Adele(really feeling the double name, Mary Adele! ), Adelaide, and Ariadne! I know a little Adella Kyle. She goes by Addie Kay. The extra ll’s and a are a little too much name for me. I might go with Adela, though. Also, twins named Ellen and Adele – I think it’s a great combo and uncommon for 17 year olds! Those parents beat a trend! Adelais is just lovely. Adesina is pretty too. I think the s sound makes this classic sound a bit fresher to my ears. Ooh, yes, Aditi. . . and Aditya. The sound rubs me the wrong way, but probably because most of the people I know bestowing it on their tots are doing so with “Addison” which just makes me think of the disease. Most of the long-form names I like though — Adele and Adair and such. I just don’t know why you’d give your child such a lovely name as Adele and then call her “Addie.” It’s not any shorter, and it’s not anywhere near as pretty. Then again, it’s like nails on chalkboards to hear people call my daughter by the most common nickname of her name. It makes her sound like a redneck. Why do they assume that’s her nickname? They haven’t heard it from me! I hear you! Addison = disease, at least in my mind. We’re not calling our kids Hodgekin and Parkinson. Oh well. I should probably add that I actually don’t know any Addisons. Often my perspective on a name will change once I can actually put a [sweet little] face to it. I know a 5 year old Addison, and it does help. I still really dislike the name, though. Adelaide, Adele, Ada–those are all gorgeous to me. I even like surname Adair (it has a dashing quality, must be the “dare” sound) and Aderyn, even though they aren’t typically my style. I considered Adina/Idina as a tribute to my MIL Nadine, who goes by Dina. I agree about Addison. I work in the veterinary profession, so to me naming a daughter Addison is akin to naming a son Parvo Virus. Adah is my choice for my future child and since it’s my beloved great grandmother’s name, I have no hesitation of using it. But I’m distressed by the idea that it might be one of a lot of little Addies out there. I won’t use Addie as a nickname, either. I’m sure my ggrandma pronounced hers “AHH-dah” because she was Dutch, so I don’t know how I want to say mine. A-Duh seems easier, but AHH-dah wouldn’t be so close to Addie. Who knows. In my third year of university I read Romance of the Forest and decided I wanted to use Adeline as a middle name for a hypothetical future child. Fast forward a few years and I did indeed have a baby girl and, after all the typical discussion and thought that goes into baby naming, Adeline became a portion of her name. I was just beginning to become aware at the time at the upsurge in popularity of “Ad” names, so there was no way Adeline was going to be used in the first spot (although I confess to suggesting Adelaide as a nod to the family name Heidi). The heroine of Romance of the Forest’s name is pronounced Ad-a-leen. We went with the more familiar phonetic pronunciation with the long I sound because it flowed better. All that is to say, if I did want to use an Addie name in the first spot, I probably would go with Adelaide/Adelheid. Adeline is a nod to my university years, but I wouldn’t give her a first spot. Just Addie for me. Though if I had to choose I’d pick Hadley (not on your list) nn Addie. I like Adele and Adelaide but they’re a bit too buttoned-up for me. Another name I just ran across is Adley; it’s a variation of Adlai which is a Hebrew name meaning God is just. Ada or Adah for me, if I were doing it at all. I don’t say Adah the same as Ada, so that’s why I’m putting it up as a missed thing. It’s got that second-syllable emphasis that always made me wonder why it never caught on as a middle name, surely Marie can’t have all the second-syllable-emphasis love to itself? Ada is probably more approachable and less likely to be butchered, though. I chose the name Adair for my daughter, born in May 2008, and my parents instantly monikered her with the nickname of “Addie.” I agree with the author’s assertion that it is a nice blend of the exotic (Adair) with a twist on the familiar (Addie). I also think Adair by itself sounds unique yet classic all at once. […] Looking for a lighter form of the clunky Edgar?